What Do a Yoga Festival and Personal Financial Planning Have in Common? 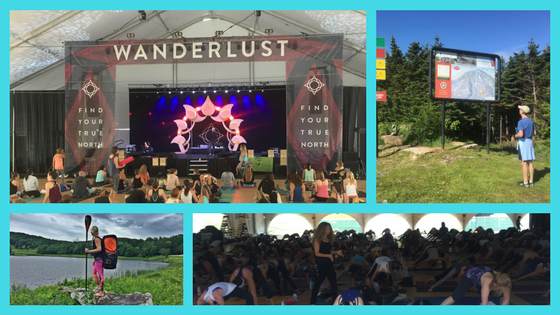 In June I went to my first yoga festival, Wanderlust, at Stratton Mountain Resort in Vermont. My wife and I joined our daughter, Jessie, who was teaching her FloYo (stand up paddle board yoga) classes at the event. Wanderlust was started in 2009 and has been held in a number of amazing locations around the world each year. As many of you may know, I am an avid practitioner of yoga, so we completely enjoyed this experience. We took a wide variety of classes from some of the leading yoga teachers from around the world, we heard great music from a wide variety of artists, we did a lot of hiking, and took classes in photography, cooking, etc. While it is considered the “grandfather” of yoga festivals, the focus of Wanderlust is to help you “find your True North.” Woven through the yoga classes, musical performances, and other events was the theme of helping you answer the question, “What is your purpose?” You could delve as deeply into this question as you chose over the course of the four days. The opportunity to get out of my normal routine and be part of this amazing community was great on many levels. I also found many parallels to the work we do with clients in the personal financial planning area. When we work with clients to help them plan for their future, we need to understand what is truly important in their lives. While we focus on the financial aspects, we need an underlying understanding of their goals to do our jobs well. We see the importance of these kinds of discussions regularly in our client meetings but it was especially clear shortly after I returned from Wanderlust. While meeting with a successful couple, both physicians, we were talking about the financial issues surrounding their plans to retire in the next 5-10 years. They are both leaders in their field and have very successful practices. While they are on track for a good retirement situation from a financial standpoint, we had never really discussed what they would do with their lives after they stopped working. As we asked more open-ended questions and gave them a chance to articulate their vision of life in retirement, a very different picture emerged. While they did so reluctantly, they gave us a good sense of what they would really like to do, where they would like to live, and how they planned to spend their time. We talked about the things they are most passionate about. Now we can integrate that into the financial planning and help them lead the life they want. While there are many different approaches to identifying what is most important to you, these are crucial questions to ask and think deeply about as you go through the financial planning process. We are here to ask these questions and listen to your answers. When we can integrate this information into our analysis of the financial aspects of your planning, you will then have a plan that is well aligned with the most important things in your life. Let us know how we can help you with this!